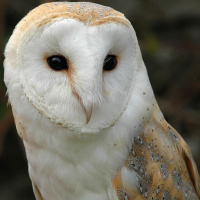 The Barn Owl is a medium sized owl with no ear-tufts and a heart-shaped face. These pale, nearly worldwide birds are closely associated with man through their traditional use of barn lofts and church steeples as nesting sites. The species name "alba" refers to the colour white. 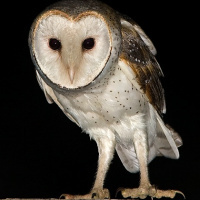 Other names for the Barn Owl have included Monkey-faced Owl, Ghost Owl, and Church Owl. Typical Call - Prescott, Arizona, USA. © Doug Von Gausig. Pair calling - Peck's Lake, New York, USA. August. © Doug Von Gausig. Twittering - Elkhorn Slough, Central California, USA. © Doug Von Gausig. Description: The facial disc is white with a brown edge, and with a brownish wash between the lower edge of the eyes and the base of the whitish-pink bill. Eyes are brownish-black. 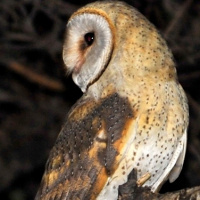 The crown and upperparts are yellowish-brown to orange-buff, covered partly by a pale ashy-grey veil marked with scattered white spots surrounded by black. The tail is similar, with a few darker bars and with white dots near the tips of the feathers. 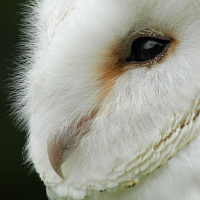 Underparts are whitish or pure white with a few small, dark drop-shaped spots (often more on females). Size: Length 29-44cm. Wing length 235-323mm. Tail length 110-125mm. Weight 250-480g. Females often heavier than males. 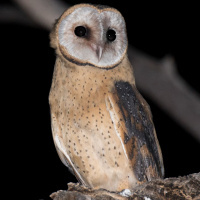 Habits: Generally nocturnal, although it is not uncommon to see this species emerge at dusk or be active at dawn, occasionally being seen in flight during full daylight. Flight is noiseless, with wingbeats interrupted by gliding. 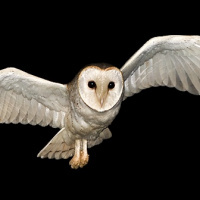 Voice: The Barn Owl calls infrequently, the usual call being a drawn-out rasping screech. The courtship call of male at nest is a shrill repetitive twittering. Adults returning to a nest may give a low, frog-like croak.When surprised in its roosting hollow or nest, it makes hissing and rasping noises and snapping sounds that are often called bill snapping, but possibly made by clicking thetongue. 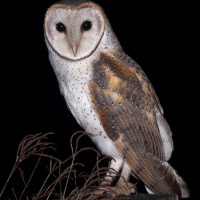 Hunting & Food: Barn Owls specialise in hunting small ground mammals, and the vast majority of their food consists of small rodents. Voles (field mice) are an important food item, as well as pocket gophers, shrews, mice and rats. 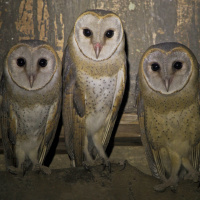 Barn Owls breed rapidly in response to mouse plagues. Other prey may include baby rabbits, bats, frogs, lizards, birds and insects. Prey are usually located by quartering up and down likely looking land - particularly open grassland. 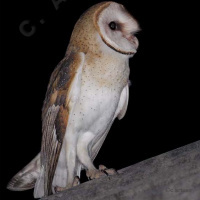 They also use low perches such as fence posts to seek quarry. 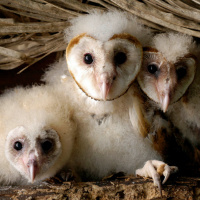 Breeding: Barn Owls will breed any time during the year, depending on food supply. In a good year, a pair may breed twice. 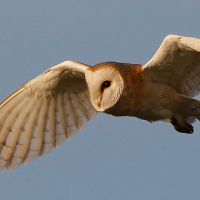 Rodent plagues cause Barn Owl numbers to increase dramatically. 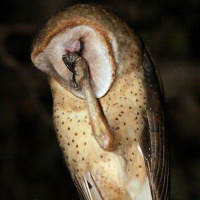 During courting, males may circle near the nest tree, giving short screeches and chattering calls. 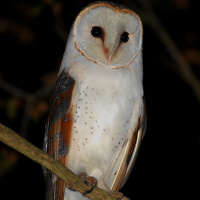 The majority of Barn Owls nest in tree hollows up to 20 metres high. They will also nest in old buildings, caves and well shafts. 3 to 6 eggs are laid (occasionally up to 12) at 2 day intervals. The eggs are 38-46mm x 30-35mm and will be incubated for 30 to 34 days. Chicks are covered in white down and brooded for about 2 weeks, and are fledged in 50 to 55 days. After this, they will remain in the vicinity for a week or so to learn hunting skills and then rapidly disperse from the nest area. Young birds are able to breed at about 10 months. 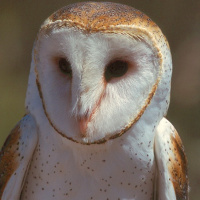 Mortality: Barn Owls are short-lived birds. Many die in their first year of life, with the average life expectancy being 1 to 2 years in the wild. 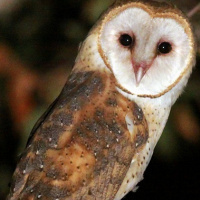 In North America the oldest known Barn Owl in the wild lived to be 11 years, 6 months. 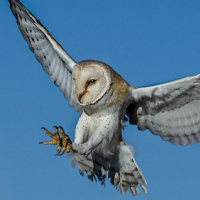 In Holland, a wild barn owl lived to be 17 years, 10 months old. 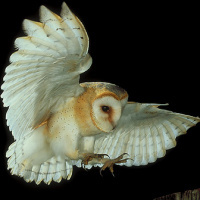 In England, a captive female barn owl was retired from breeding at 25 years old! 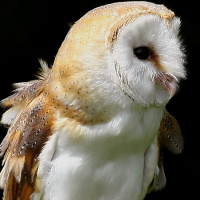 Habitat: The Barn Owl is found in virtually all habitats but much more abundantly in open woodland, heaths and moors than forested country. 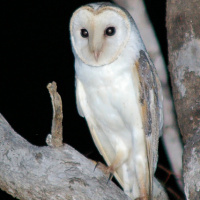 They usually roost by day in tree hollows but have also been found in caves, wells, out-buildings or thick foliage. 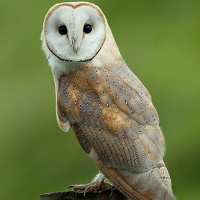 Distribution: The Barn Owl is one of the most wide-spread of all land birds. They are found on all continents (except Antarctica) and large islands and occur over the whole of Australia, including Tasmania. They occur throughout most of Britain and Europe and across many parts of Asia, Africa, and in much of North America. In South America they are found in areas of suitable grassland, as well as on oceanic islands such as the Galapagos. They were introduced to Hawaii in 1958. Status: Generally common, varies with continent. Original Description: Scopoli, Giovanni Antonio. 1769. Annus I-(V) Historio-Naturalis, p. 21-22. 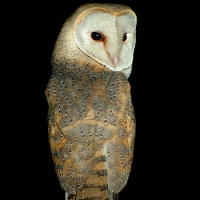 See also: Other owls from North America, Central America, South America, Africa, Europe, The Middle East, Asia, Oceania, Genus: Tyto.